�����Although Gold is down this morning, most analysts feel it is headed toward the $1,400 mark. It was near or above $1,380 most of last week and the higher prices have been very encouraging for the coin market. Collectors and investors continue to purchase just about anything that hints of potential future profits. Better date Gold still commands much of the attention primarily because of the low mintages and availability. A few weeks ago we mentioned how robust the $10 Gold Liberty market is for the rare dates. Now many $5 Gold Liberties are being added to want lists as well. 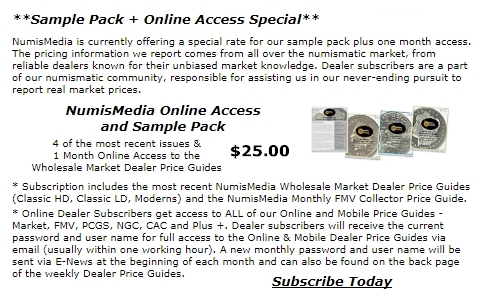 The NumisMedia 500 includes many of these issues along with a variety of other rare date coins. The list below is just some of the many rarities attracting buyers in the last 30 days. now with a Market of $12,500. 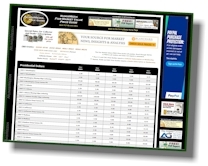 �����This week�s HD Wholesale Market Dealer Price Guide shows many increases throughout the charts. There are buyers for most any Half Dollars through Gold as long as the coins are nice for the grade with no major distractions. There are a number of advances for Bust Halves, mostly in the AU50 to AU58 range. 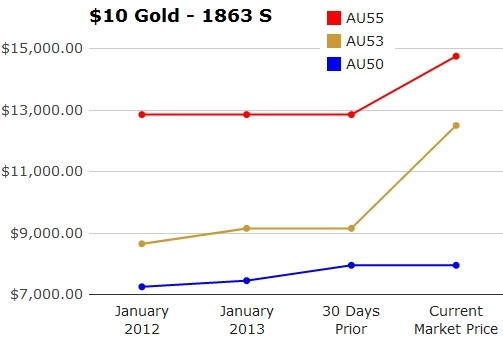 The 1809 is up to $1,150 Market in AU55 while the 1812 in AU58 increased to $1,175. The 1814 also jumped to $1,400 in AU58. �����Activity in the metals market forces many dealers to spend much of their time buying and selling Gold, Silver, and Platinum, but they still have lots of clients who are chasing after Morgan and Peace Dollars. The rare 1879 CC in MS65 is higher this week at $25,500 Market and the 1880 CC in MS67 climbed to $13,250. Several of the S Mints are receiving exposure with buyers pursuing the 1883 S in MS64, the 1885 S in MS66, and the 1886 S in MS66; all are higher this week. 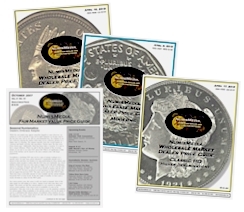 �����Specific dates within the Peace Dollar series have been moving in and out of dealer inventories rather quickly over the last several months. Some of these dates and grades are becoming more difficult to obtain at reasonable levels. Just about any date after 1926 is easy to sell for most dealers. All the 1927 and �28 coins are higher this week in MS64. Also on the rise are the 1934 in MS66 at $2,825, the 1935 in MS66 at $2,425, and the 1935 S in MS66 at $2,650.